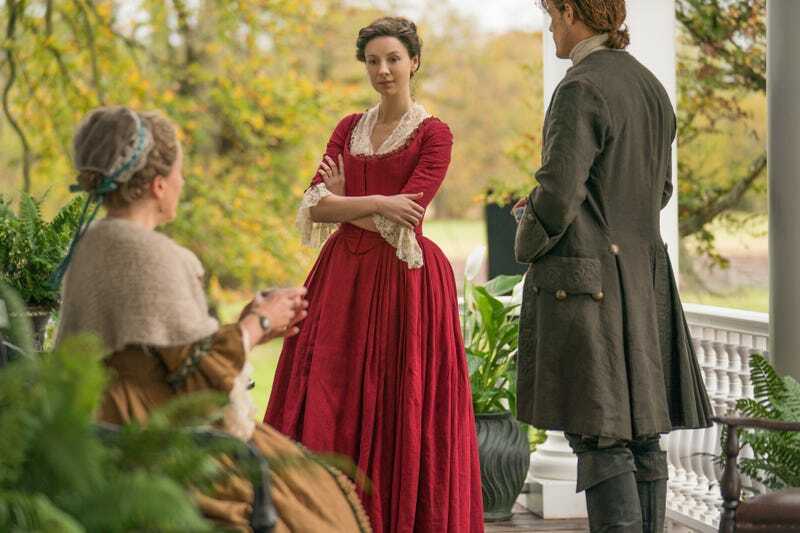 Penniless and recently traumatized by a violent robbery, Claire, Jamie, and company arrive at Jamie’s aunt Jocasta’s plantation a bit weary but also strangely recovered from the incident. Jamie dwells on it for a bit, punishes himself for being too trusting. But then they’ve moved on to the next phase of their American journey: solving slavery. Or, at least, they try. But Outlander makes it clear that Jamie and Claire can’t single handedly bring down an entire institution. The characters—and the show—face slavery head on in a way that hasn’t happened yet. That said, there’s still something off in the way Outlander handles this story, continuing to place Claire and Jamie on pedestals as it introduces Black characters solely for the purpose of peddling this plot. We already got a pretty clear message at the end of last episode that Outlander isn’t quite equipped to take on the big discussions about American history and slavery that it seems to want to delve into when Claire essentially explained slavery to a free Black man. Now at River Run, Claire gazes on at the slaves disapprovingly, and Jamie meekly reminds her that one day it’ll be different. Sure...one day, nearly one hundred years from now. As for Aunt Jocasta—played stoically by Maria Doyle Kennedy—yes, she’s a slave owner but a benevolent slave owner, the show practically screams, as if such a thing were even real. Jocasta thinks she treats her slaves “as friends,” and Claire pushes back on her a little bit, but Outlander still seems largely concerned with drawing Jocasta in some contrast to her neighbors instead of as just another cog in the system that upholds slavery. Jocasta’s characterization perpetuates the troubling myth of the “good” slave owner. Jocasta and the local officers who defend slavery throughout the episode use all the usual talking points used not only at the time but also in present day as a way to couch slavery as “not entirely evil,” rhetoric that frames slavery as a “work opportunity.” They’re certainly believable characters in 18th century North Carolina, but Outlander still seems vaguely apologetic of Jocasta, making it seem as if she has no other choice but to participate in the way that things are. And the same can even be said of Claire. Claire might attempt to push back on the way Jocasta views slavery, but at the same time, she lets Phaedre dress her. She plays along. Again, as with last episode, she still benefits from slavery, still participates in the system, even if it’s in supposedly passive ways. Outlander has backed itself in a corner here. It wouldn’t be right to ignore the realities of slavery entirely, and “Do Not Harm” goes to great lengths to portray the horrors of slavery, but it does so with a slight sense of detachment, letting it unfold through Claire and Jamie’s eyes, rooting the experience in their perspective as sympathetic but detached white onlookers. Because ultimately, the characters who this story actually concerns are jamie and Claire. The slaves become dressing for the narrative, side characters who have no real arc of their own, because how could they when we’ve only just now met them in the context of this episode? Rufus is, frankly, introduced only so that he can die. He’s little more than a prop in this white savior narrative. Just because the writers give him a name and a brief backstory does not make him a fully realized character. He has no real ownership of this story, even though it hinges on his death. And he doesn’t even have a say in his own death, a choice that Claire makes at the behest of Ulysses but still without asking for Rufus’ consent, and isn’t that what she previously tries to get through to Jocasta? That these slaves don’t have a say in their fate? And here she is, choosing his fate simply because Jamie assures her it’s the only way to “do no harm.” There’s a small moment that could imply consent from Rufus, but it’s far from explicit. On the surface, maybe Rufus’ death serves to convey the horrors of slavery, but the way it plays out, it seems like it’s more about crystallizing Jamie and Claire as the heroes of the story. He becomes a plot device in their arcs, a casualty of their ongoing moral dilemma. Outlander has chosen to center white characters, and its attempts to open up its world this season are well intended and welcome. Again, the show certainly should not ignore the role that slavery plays in the world Jamie and Claire inhabit. But these attempts have also felt empty and forced. Names are a bare minimum for character development, and even Rufus’ backstory only unfolds because Claire asks for it. The story is still very much in the control and perspective of Jamie and Claire. They’re the protagonists after all. But Outlander is didactic in “Do No Harm” in a way that merely services these protagonists. Even the final scene centers their reaction to the tragedy—their horrified, helpless looks—rather than the tragedy itself. Young Ian’s sudden obsession with Native Americans is also troubling, and his fetishisizing gets played as just naive boyhood. And while lots of characters on the show seem to have a lot to say about Native American people, there have yet to be any Native American characters speaking for themselves (that’s supposedly going to change as the season progresses). I do really enjoy Maria Doyle Kennedy. She’s an underrated character actor. The episode also introduces John Quincy Myers, a new character who seems to take Ian under his wing.